The Nobel Peace laureate Muhammad Yunus brought a host of criticisms of conventional banking to Dubai this week as he called for a “new financial system” that prioritises the needs of the world’s poor. He told an audience of Islamic bankers that a global financial system that served the rich “was one reason why the whole planet remains entirely unsustainable”. He addressed the opening session of the Global Islamic Economy Summit in Dubai with a similar message yesterday morning. The World Bank estimates that 2 billion people – about 48 per cent of the world’s adult population – are without bank accounts. The UAE has a banking penetration rate of 135 per cent, according to the management consultant AT Kearney. “That wealth is increasing … because wealth is like a magnet – the more you have, the more it attracts. It’s just the way the system works for [the rich],” said the Bangladeshi banker and social entrepreneur, who was awarded the Nobel Prize in 2006 along with Grameen Bank for their “efforts through microcredit to create economic and social development from below”. “I’m not blaming you – bankers are good people,” Mr Yunus told his audience of Islamic bank executives. “It’s the system, it’s the concept, it’s wrongly designed. And nobody’s paying attention,” he said. “I’m a strong critic of the banking system, and I’m surprised that you invited me,” he said. Mr Yunus completed a doctorate in economics from Vanderbilt University in the United States. He then taught economics at Chittagong University in Bangladesh. “I was just like any other teacher in the world,” Mr Yunus said. But he despaired at the prevalence of rural poverty in his home country. “The situation in Bangladesh was so horrible. And here you teach elegant theories of economics in the classroom, beautiful theories, mesmerising – and then you walk out of the classroom and see deathly faces, people dying from hunger of all things. 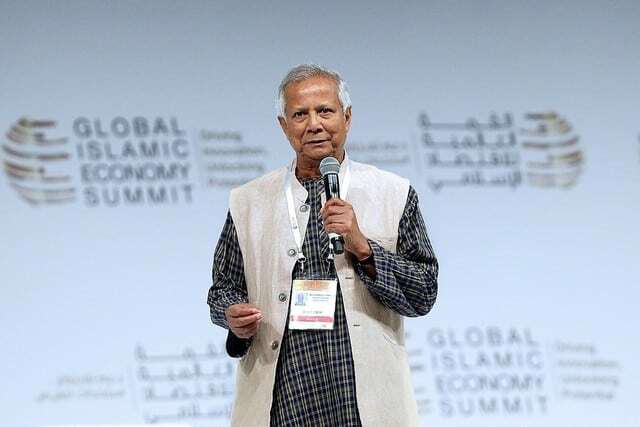 This led Mr Yunus to begin experimenting with issuing small value, zero-interest loans to Bangladeshis in the clutch of loan sharks before launching Grameen Bank in 1976, which issues small loans to people who lack access to bank accounts or microfinance. Mr Yunus is regarded as the founder of microfinance, which has almost become a US$5 billion industry.